Brush the oven soufflé dishes with the liquid butter and sprinkle with sugar. Repeat this step. Stir the hanging curd with the starch and the lemon and orange peel. Roughly chop the pine nuts and pistachios and roast in a frying pan without any fat. Allow to cool a little and stir into the curd mixture. Cold whisk the egg whites with the sugar and fold in under the curd mixture. Whisk the egg white with the sugar and when whisked fold carefully into the curd/egg yolk mixture. Now fill the finished soufflé mixture in the prepared dishes and spread smoothly with a palette. Bake the filled dishes in a pre-heated oven with top heat and bottom heat at 200 °C for about 15-20 minutes until the surface is golden brown. Either turn the curd soufflés over onto a plate or serve in the soufflé dishes sprinkled with a bit of powdered sugar. Serve the cranberry compote separately. 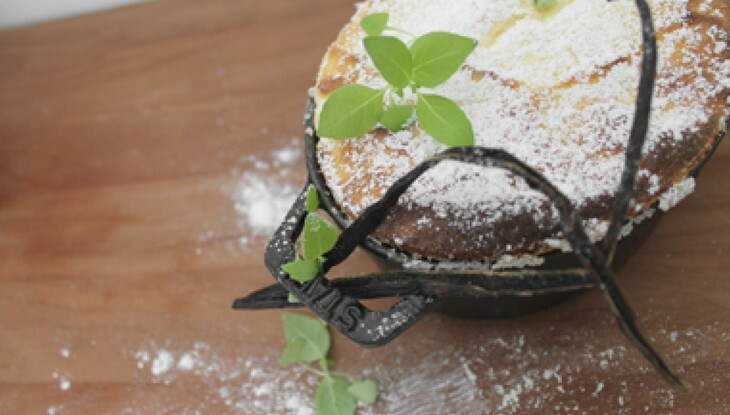 TIP: Place the soufflé dishes on a baking tray with some water or in a deep roasting dish. Lay out with a dish towel so the dishes do not slip. Act swiftly when arranging and serving otherwise the soufflé will collapse. Bring the white wine, sugar, water and vanilla to the boil and add ¼ of the cranberries and soft boil them. Remove the vanilla pod and puree with a blender or food processor. Briefly bring the remaining cranberries in the sauce to the boil and then immediately cool them. Sweeten to taste with some sugar.